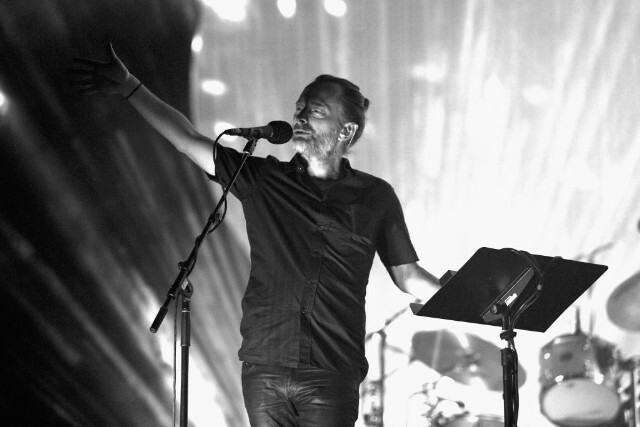 In February, “audiovisual composer” and periodic Thom Yorke collaborator Tarik Barri announced that he would be collaborating with the Radiohead frontman on an original new installation project through Berlin’s Institute for Sound and Music. The 360-degree sound installation was, according to Barri’s desciption, to feature “[Yorke] singing in my virtual ‘Versum’ universe”—Versum refers to customized software invented by Barri—and “presented in AV surround.” The piece was designed for the ISM Hexadome structure in the Martin-Gropius-Bau Museum in Berlin, which features 54 speakers and 6 screens surrounding the audience on all sides. Now, as Pitchfork points out, Barri has released a clip of his collaboration with Yorke, which is entitled “City Rats.” According to the video’s description, the piece will be unveiled on April 21 at the Hexadome. The ISM website’s description provides more details about the piece: “Looped and distorted video fragments of Yorke’s singing are scattered all around, forming, moving, and changing patterns. Twitching and pulsating, they fill the space with unfamiliar sounds and sights.” Watch and listen to part of “City Rats” below.